To celebrate, customers on a flight from New York-JFK to Los Angeles enjoyed a champagne toast as the names of first-time nominees were announced. 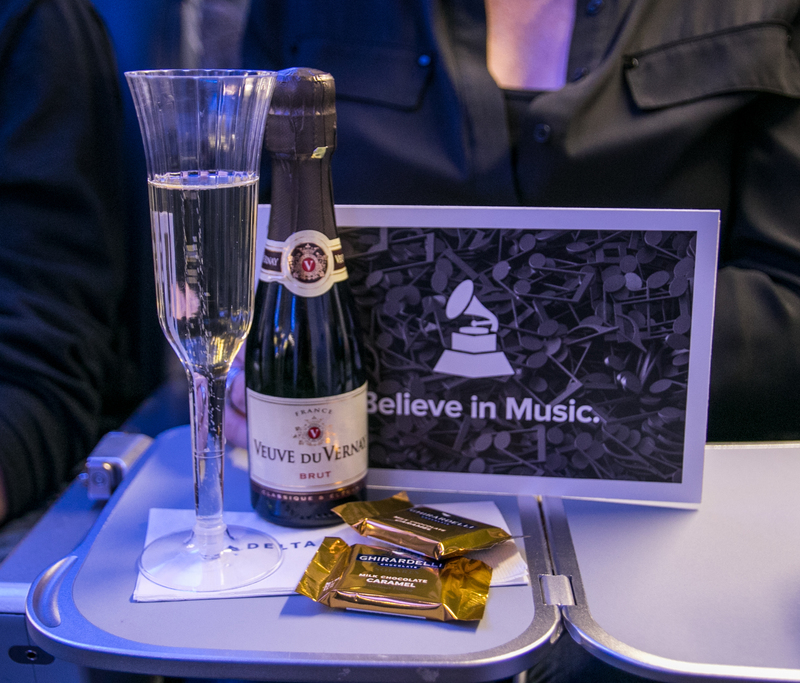 Later in the flight, one lucky passenger won two tickets to the 59th GRAMMY Awards on Feb. 12. Each passenger was provided instructions to access a curated Spotify playlist featuring music from each of the first time nominees. 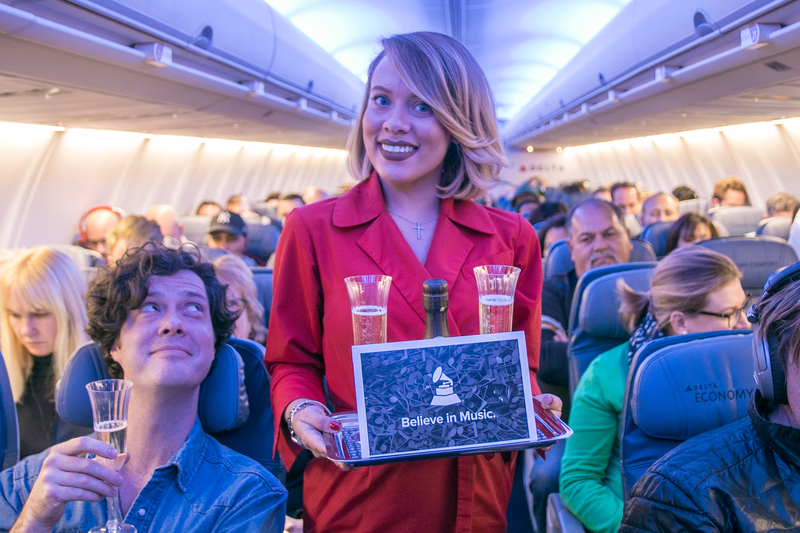 In February, the airline will toast "Music's Biggest Night" for the 10th straight year as the Official Airline Partner of the GRAMMY Awards. This year's first-time nominees include Demi Lovato, Blink-182, Anderson .Paak, Chance The Rapper, Flume, Gojira, Halsey, InfaRed, Lukas Graham, Maren Morris, PartyNextDoor, Twenty One Pilots, William Bell and Solange. Delta's ties to the music and entertainment industry run deep, and the airline is committed to serving the needs of the entertainment and production community.​ In addition to partnering with The GRAMMY Awards, Delta is also the official airline of the GRAMMY Museum, giving the airline naming rights to various major public programs and interior branding exposure in the Museum and on all proprietary Museum programs and related marketing initiatives. Through its Delta Artist Spotlight program, Delta has celebrated and featured onboard 33 established and emerging artists since June 2014, including two of this year’s GRAMMY nominees – Cage the Elephant and Lukas Graham. And throughout the year, customers in all cabins of service enjoy free entertainment through Delta Studio, the airline's industry-leading suite of onboard entertainment that offers up to 300 movies, 750 TV shows, 100 foreign film titles and 2,400 songs. Since 2009, Delta has been the fastest-growing carrier at LAX, more than doubling its number of seats and growing from 70 daily departures to more than 175. This year, the airline launched five daily flights from LAX to Denver International Airport, a key route for business travelers in Los Angeles; expanded the Delta Shuttle to include Los Angeles-Seattle and Seattle-San Francisco in addition to Los Angeles-San Francisco; increased service to both New York-JFK and Seattle to 10 daily flights; added a third daily flight to Boston; and is launching new Aspen and Los Cabos service in December. Delta designs 10th playground with KaBOOM! in L.A.